Nice companion to my black MacBook! 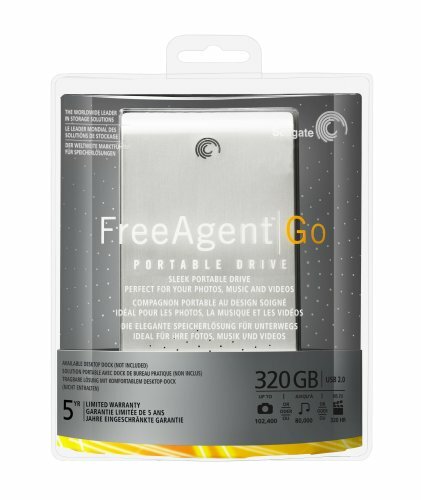 My Free Agent Go 500GB died after just a couple weeks of use. Worked fine for awhile and then no matter what PC I plugged it into, no lights, no drive detected...nothing. Tried a different USB cable and that didn't help. Went to Seagate's support website and that did not work either. Tried to post to the community forum for help but could not register. No matter what email address I used Seagate said "this email is already in use". If I tried a "forgotten password" etc. I got a message saying that Seagate's system was having technical problems and to please call or email support. For the low price, I'd overlook a common problem: the drive cannot be easily removed. Iomega and Buffalo are two notable example of 2.5" products that can be easily removed in case the USB/FireWire controller malfunctions and the drive still works. No one should send the drive out with data in it. The top aluminum is thin enough to be an insulator rather than heat sink (aluminum dissipates well if it is thick, but it becomes the opposite when it is thin). I haven't opened this unit yet, but I wonder if the aluminum skin is adhered to the drive with heatsink paste. The aluminum top cap is glued to the bottom case though. The drive inside is 9.5mm (0.375") and the case is 0.49", so there is really wouldn't be much air space between the drive and the top aluminum skin after you add the bottom shell and PC board. I bought this drive as a portable alternative to my LaCie d2 backup drives. I also have to admit liking the styling and build quality -- it feels solid enough (though clearly not a 'tough drive') and I saw no reason to have something ugly sitting on my desk when it was in use. It's a portable drive so you obviously don't get the sustained throughput of a full-sized HDD, but given that it's small and light enough to be negligible as a factor in carrying to and from work. I'm guessing that the power draw of the drive is sufficient that you'll want to check all of your USB ports when you connect it up: I found that one of ports on my laptop couldn't supply enough power, but the other one did. You also want to use the shorter cable supplied rather than one of the potentially more convenient long cables that you might have lying around. so far so good. so slim, so small, so black. I never write reviews, but this product is excellent! This hard drive is exactly what ext hds out to be in that it of course has lots of external storage, but also an outstanding GUI to sync your information. The management software looks for changes on you computers and if you set it accordingly (which is default) only writes the changes to your Seagate drive. For example, the first time you install it, Seagate asks what you want to save (My Docs, Desktop, etc. ), it then saves this information to the drive. Then, the next time you plug it in, or on schedule, it looks for changes that you saved to your computer. This way it saves only the new files, and preserves your free available space on the drive and more importantly maintains a coherent view of your data. Another plus: it uses a mini USB plug for its connection and power (only one cord needed). This is the same plug size for Blackberry, Motorola Razor and other things. So I use these cords interchangeably all the time. I own two portable hard drives, a WD Passport 230GB and a new Seagate Freeagent Go 500GB. The Go, with the option of using a dock (sold separately) is the more convenient of the two. The Go is also significantly faster in read/write access times. The Passport tops out at ~7Mbs when writing, the Go has topped out just above 12Mbs when writing. Smaller even than I expected, quiet, and fast. Just backed up the entire contents of two computers, barely making a dent in the 500 gb drive. I am also planning to use it as direct storage for large camera RAW files. Comes with a very simple to use backup/restore manager, that you can set up for automatic or manual backups and file syncing between computers. A perfect size to slip into a purse or even a pocket. Solidly made, with a rubber backing on the bottom; comes with a blessedly short USB cord. Seagate is a terrible company. I've purchased a Seagate drive in the past and it had to be replaced over 5 times. within a year. It looks nice, feels well made, and works? Well except for the File Manager program. When installing it says only works with Vista 32bit. 1. Looks great, functions great, and very portable. No complaints. 2. 298GB, not the advertised 320GB. Insert "industry measuring differences... blah blah... bytes vs bits... blah blah... everyone does it... blah blah..." here.